Introduction and history of Processed World - a quarterly paper published in 1980's and 1990's in Silicon Valley, California. PW was written by a group of radical office workers ("temps"). Unlike similar publications, PW made good use of humor and art to sharpen its subversive attack. ...or are you being processed? Processed World magazine was founded in 1981 by a small group of dissidents, mostly in their twenties, who were then working in San Francisco's financial district. The magazine's creators found themselves using their only marketable skill after years of university education: “handling information.” In spite of being employed in offices as “temps,” few really thought of themselves as “office workers.” More common was the hopeful assertion that they were photographers, writers, artists, dancers, historians or philosophers. Beyond these creative ambitions, the choice to work “temp” was also a refusal to join the rush toward business/yuppie professionalism. Instead of 40-70 hour weeks at thankless corporate career climbing, they sought more free time to pursue their creative instincts. Nevertheless, day after day, they found themselves cramming into public transit en route to the ever-expanding Abusement Park of the financial district. Thus, from the start, the project's expressed purpose was twofold: to serve as a contact point and forum for malcontent office workers (and wage-workers in general) and to provide a creative outlet for people whose talents were blocked by what they were doing for money. The idea for a new magazine struck one of these people, Chris Carlsson, while he was on vacation in the summer of 1980. The sources of this brainstorm were simultaneously a certain socio-economic layer of late twentieth century U.S. society, a group of friends, and certain obscure artistic and political tendencies comprising both post-New Left, post-situationist libertarian radicalism and the dissident cultural movement whose most public expression was punk and new wave music. In the late seventies a number of radicals around San Francisco and New York who had ridden out the decline of the social opposition with brains unscrambled, principles more or less intact and rage intensified, found themselves drawn to the punk/new wave milieu. Incoherent and often crude as it was, it looked like the only game in town-the only place where fundamentals of the ruling ideology like Work, Family, Country, Obedience, and Niceness were being challenged with real panache and real venom. Some of these people formed bands while others organized shows. And still others worked in graphic media such as posters, fanzines and comic books, or revived street theater and other kinds of political performance. Between these people, numbering at most a few thousand around the country, images, ideas, jokes, slogans and techniques circulated like amphetamines in the cultural bloodstream. Before the founding of Processed World, several participants had already shared in such activities. Chris Carlsson, in fact, first encountered PW co-founder Caitlin Manning and early collaborator Adam Cornford in a Bay Area agit-prop group called the Union of Concerned Commies. The UCC began in early 1979 as a left-libertarian intervention into the anti-nuke movement, then at the height of its strength and militancy. This intervention involved a serious attempt to present radical critique with attention-grabbing style and innovative use of media. For instance, the same cartoon graphics (usually by Jay Kinney and Paul Mavrides of Anarchy Comix) appeared on leaflets, posters, and T-shirts distributed at antinuke events. Some of the UCCers settled in for a sustained effort within the movement, mostly through the Abalone Alliance newspaper It's About Times. Others, with lower tolerance for the somewhat sanctimonious neohippie antinuker culture, looked around for more exciting terrain. A glimpse of such terrain was provided by San Francisco's notorious “White Night Riot” of May 21, 1979. That night, an angry crowd of gay men and women, quickly joined by hundreds of young workers and marginals, attacked San Francisco City Hall and the police following the announcement of a slap-on-the-wrist sentence for macho former cop and former supervisor Dan White, convicted killer of Mayor George Moscone and gay supervisor Harvey Milk. Several UCCers participated in the events, and immediately afterward mass-produced a T-shirt (designed by Paul Mavrides) showing a burning cop car, the date and place of the riot, and the words “No Apologies." Thus began the street theater phase of the UCC. The declaration of war-backed up with a list of typical wartime measures like rationing, curfew, suspension of the right to strike and censorship -evolved into a full-fledged satirical revue, complete with reworded versions of the Marines' Hymn and “Over There,” skits about the political-economic function of war and the militarization of daily life and lots of marching about and shouting ironic slogans like “One, two three, four! We can't wait to go to war!” In fact, much of the group's satirical bite was directed against the Leninist and social-democratic leftists and their own complicity in capital's authoritarianism and work fetishism. This made the group as unpopular with the apparatchniks of the left as it was popular with the “unorganized” and generally bored stiff audiences at anti-draft and antinuke rallies. It was the most fun any of us had had doing agitational politics. Alas, the strains of unpaid political performance work, insufficient rehearsal time and an escalating conflict over “amateurism” versus “professionalism” tore the group apart within a few months. (It is difficult to gauge the role of the disintegrating social-political culture, and its diminishing possibilities for intervention, in the demise of the UCC, though it surely played its part.) But well before the breakup, the spirit that had animated the UCC was finding a new home. Before PW was even thought of, Carlsson and partner Caitlin Manning produced a leaflet for National Secretaries Day in April 1980 called “Innervoice #1'' (under the name “Nasty Secretaries Liberation Front” ). The leaflet foreshadowed the PW style. One side was a mock invoice listing the prices paid by an average office worker for her unhappy life. The other was a short analytical essay called “Rebellion Behind The Typewriter.” It referred pointedly to the collective power of information handlers to subvert the circulation of capital. A year later, in April 1981, the first Processed World hit the streets, Carlsson and Manning having been joined by ex-UCCers Adam Cornford and Christopher Winks (and Steve Stallone as pre-press consultant and printer) in producing that first issue. Finding themselves amid the bulging supply rooms of the modern office, Processed World's friends began collecting resources for the magazine; the first two issues were printed on paper unknowingly “donated” by San Francisco's major banks. A short while later, Gidget Digit and a half dozen others, mostly already friends of the founders, joined the newborn project. The cover art for PW 2 was drawn by a woman who, with her co-worker, wrote in the first wildly enthusiastic letter received by the magazine, and helped realize PW's role as forum. Another new contact, Bonita Thoreson, frustrated with her efforts to write for the proto-union “Working Women” newspaper Downtown Women's News, became an avid participant when she discovered PW's hawkers on a busy downtown street while she was temping. Other participants came in the same way. Processed World's founders saw the importance of community—without horizontal links between people in similar predicaments, no amount of rhetoric, agitation, or sabotage would begin to change conditions. Every Friday writers and editors would head out to the streets to hawk magazines, asking a dollar donation rather than “selling” so as to avoid restrictions on street merchants and to remain protected by the First Amendment's freedom of speech provisions. Collective members would don papier-mache costumes. These, like VDT heads-masks labelled “IBM—Intensely Boring Machines” and “Data Slave,” or an enormous detergent box whose familiar red-and-yellow sides read “Bound, Gagged, & TIED to useless work, day in, day out, for the rest of your life?” attracted immediate if often puzzled attention from passersby. Sellers pranced around on busy financial district streets, while yelling “Processed World: The Magazine With A Bad Attitude!” or “Are You Doing the Processing, or Being Processed?” or “If You Hate Your Job Then You'll Love This Magazine!” (In fact, many of PW's slogans evolved as such street cries, spontaneously composed on the spot.) In this way, PW managed to develop and maintain a fairly close rapport with its office workforce constituency. Many fascinating dialogues took place during these Friday lunch hour soirees, and a feedback loop was established whereby readers, writers and editors would discuss articles in person, right on the street. More formal social events were developed in pursuit of a new dissident community. Bi-weekly gatherings at Spec's bar in North Beach began in February 1982; these grew to attract upwards of 40 people every other Wednesday night, until they died out two and a half years later, in late 1984. Processed World always depended on collating parties, a modern-day urban version of the barn-raising. A week or two prior to the finish of printing, a leaflet would go out to the entire Bay Area mailing list, inviting people to come and help collate the forthcoming issue. Many people, isolated at their jobs, would delight in coming to the collating party as their main opportunity to contribute more than money to the PW effort, and as their chance to attend a kind of radical intellectual salon. From noon to as late as midnight, 50-100 people would pass through and take a shift sitting before a tall pile of pages. Amid clouds of marijuana smoke, bottles of beer, and a rich potluck buffet, each person slowly passed the folded pages along, adding their two or three, until collated copies were boxed at the end of the line, ready for the bindery. Collating parties lasted through issue 18; by then, every joke and humorous aside about assembly lines and free labor had been thoroughly exhausted. PW finally went “upscale” and started paying to be printed and bound by a web-press company. On Saturday, April 14, 1984, Processed World organized a tour of Silicon Valley, hosted by Dennis Hayes, PW's then newfound SilVal writer. Piling into an old blue bus, some twenty-five malcontents proceeded on a performance/happening to visit a the fabled Valley, by way of the Airforce's Blue Cube satellite control center, the Rolm Corporation's campus-like offices, and Benny Bufano's giant missile-like Madonna, and the squeaky-clean Fashion Island shopping mall. The tour got plenty of attention from nervous security guards and even received a weird write-up in Infosystems magazine, continuing PW's already considerable media coverage. Just a month later, The End Of The World's Fair, a radical cultural festival aimed at providing alternatives to the New Age pieties of the mainstream peace and ecology movements, was held in S.F. 's Dolores Park. The organizing for the event was done out of the PW offices (primarily by Gary Roush), though the committee behind the Fair was separate from the PW collective. The Processed World collective created a float called “Terminals With Ears” and, with its many props, made a memorable appearance in the Fair's costume show. Annual picnics at various Bay Area parks provided another place for people to meet. While a community did appear, at least in fits and starts, it did not last. PW never had a specific goal in creating the community, beyond hoping for a movement to erupt independently of the magazine. Many people came to the magazine and its gatherings looking for “answers,” for some kind of organizational structure or at least for an idea about what to do the next day at work. But while ideas were plentiful, PW always lacked a coherent “program.” It had no clearcut plan of action in which to incorporate people, let alone an actual organizational presence in offices. Those who came looking for such things went away disappointed. Not that the organizing-oriented and programmatic groups had a great deal more success. Attempts to organize office workers by traditional bureaucratic service-worker unions like the SEIU and OPEIU were largely a flop. Indeed these unions, like most others during the early eighties, actually lost a lot of members to decertification elections and runaway shops, which began to afflict the clerical workforce much as they had been battering industrial and transportation workers for several years already. More promising efforts, like the underground independent proto-unions Bankworkers United and IBM Workers United, with which PW had contacts in its first four years, fizzled out in the heavy rain of repression under Reagan. As the '80s progressed, and people became more atomized than they were even at the start of the decade, expectations of a political movement based on office workers evaporated. In fact, many PW participants (who have numbered in the hundreds over the course of its life) did not remain in offices either. 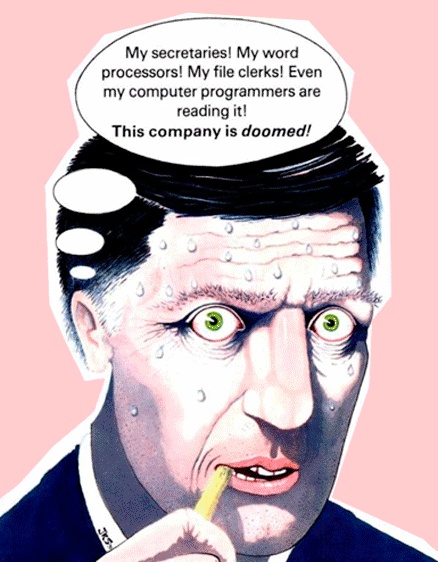 Lacking a larger opppositional movement among office workers or even a clearcut strategy for creating one, most early PWers took the classic American Way Out: they found other ways to make a living, some as computer programmers or technical writers, several as teachers, still others as graphic and production artists, although a number continue to process words as temps in offices. [From the Talking Heads introduction to PW 15]: ...The magazine has gone in a different direction than the one its founders intended. PW was to be a meeting point for dissatisfied and rebellious workers in the “new” technical and service sectors, a place where they could vent their frustrations and share their dreams. So far, so good. But we wanted to go beyond frustration-venting and dream-sharing to help develop strategies for organized resistance at work. We wanted the rebellion to become practical. In 1980-81, this didn't look so farfetched. Revolt was in the air... But as the Right got a firmer grip on the mass media and as the recession hit, terrorizing millions of workers into submission, the revolt largely faded away. Today, an atmosphere of anxious subservience, thinly veiled in born-again patriotism and consumption-mania, pervades daily life. As the opening editorial in the very first Processed World said “Rebellion can be fun, and humor subversive.” Every issue of the magazine has dedicated at least 33% of its space to graphics, usually satirical. As part of its goal to be fun here and now, and to be an outlet for frustrated creative abilities, PW gave lots of room to graphic artists, collagists, cartoonists, and punsters. What humor communicates is not simply the punchline or the meaning behind the joke, but also the pleasure of laughter itself. Aside from the sheer fun of it, the magazine's humor provides a more accessible, less direct way to express the attitudes and ideas put forth in the more “serious” articles. Humor has always been used to give vent to feelings and fantasies which are socially unacceptable or offensive, since jokes are less compromising than direct statements. The jokes themselves may be offensive, but ambiguous ("Does she really mean it, or is she just kidding?” ). People who won't or can't resort to open confrontation find an outlet in humor. Besides, many people don't form their critical perceptions of the world and themselves via rational, cognitive processes. The directed ambiguity of political humor can give people room to react and respond on other levels-attitudes, feelings, instincts. In a period when Northern American radicals are hanging their heads, dizzied by the speed of negative developments, there often isn't much in which to take pleasure. Or conversely, everything is so painfully ridiculous that it inspires sardonic despair. But political humor provides an antidote to either kind of hopelessness, because it exudes a disrespect for What Is that implies people can change it. Sharing humor also reinforces the immediate subjective pleasure of life, which can occasionally be the basis for bigger, more serious collective endeavors since it solidifies a sense of community among participants. Nevertheless, humor plays an ambiguous role at work, providing means both to reinforce and to undermine the authority of managers or routines. It can reinforce authority when it serves the purpose of laughing off real problems instead of dealing with them (e.g., the ever-present office jokes about stale and toxic air). Such cracks about occupational health parallel the common jokes about carcinogens in food. Typically, the reaction is “Oh, doesn't everything cause cancer?” The sense of hopelessness is so pervasive that most of us choose not to think about it, and when confronted, to dismiss it with a cynical half-joke. It's pretty obvious who benefits from defeated humor of that sort. Moreover, a lot of job-related humor is racist or sexist, homophobic or xenophobic, and therefore divisive. Yet the workplace is also a natural laboratory for turning humor around and reclaiming its subversive spirit. Processed World developed a humorous discourse based on the imagery and language of the business world itself. Dozens of images were gleaned from the business and computer press (Business Week, Fortune, Modern Office Procedures, Today's Office, Food Processing News and others) and then revealingly altered, or as the French would say “detournee.” Sometimes these images and slogans are used in collage, but more often they have their overt message inverted or diverted by small additions or subtractions. A subjectively truthful caption changes the sense of a conformist image, or a bland corporate catchphrase is turned inside out by a bizarre or sinister graphic. Processed World also used humor because it serves to distance the project from the deadly self-importance of dogmatic leftists and their boring, oppressive ideas of “socialism.” Seeking to encourage utopian thinking, to instill and legitimize aspirations for a world motivated by pleasure and desire, Processed World cultivated its sense of humor at every opportunity. Steve Stallone and Tom Price printed the magazine from the very first issue in a garage where they had an aging Multilith 1250 offset press. At first they worked for free, but as time went on, they were eventually paid tiny amounts, less than $5/hour. From issue 4 through 8 Freddie Baer, Caitlin Manning, Bonita Thoreson and several other helpers printed a lot of the magazine on a press at an anarchist household in the Haight-Ashbury, though Steve and Tom were always the troubleshooters and printers of last resort, a heroic task for which history will certainly reward them, since PW certainly didn't. They also resumed printing from issues 9-18. The type was set on a photo-typesetting dinosaur, a Compu-writer Junior, by a variety of people, though Chris Carlsson did the lion's share over the years. The distinctive subversive adverts and collages that peppered Processed World were produced by a long list of people, often active members of the collective, but just as often living far away. Bonita Thoreson deserves special mention for having learned all aspects of production during her many years working on PW (issue 2 through 18), and having found her true vocation in art at least in part through her experience in Processed World. Fantastic artists have been generous to PW: Freddie Baer, Matthew Finch, Melinda Gebbie, Greg Jamrock, Paul Mavrides, Adam Cornford, Doug Pray, Hal Robins, JR Swanson, Tom Tomorrow, Linda Wiens, Jim Ludtke and a host of others have all made many amazing and provocative images, without which PW would be a very different animal. After PW went to a larger format with issue 14, Pauline Paranoia and Chris Carlsson began to develop a more systematic design process, and by the time the magazine reached its “twenties,” PW had a clear and distinctive look. From its inception Processed World has sought to end the silence surrounding the underside of the Information Age. The participants' political background and detailed outlook continues to be varied, a non-doctrinaire hybrid of traditions and theories. They have in common being against capital and wage labor, nationalism and governments, and for the free association of human beings in collectively determining and satisfying their needs and desires. In short, the old loathings and the old longings, called communism by millions of workers long before Lenin and his many bureaucratic followers and descendents stole the word. Like these nameless, original theoreticians of revolution, PW collective members developed their views by bringing their critical faculties to bear on shared experiences in the world of work. The magazine's unusual and irreverent slant on issues such as ecology and women's rights stems from this anchoring in work as the primary means by which the existing society is reproduced, and has inoculated the magazine against fashionable idiocies to the effect that workers can no longer be primary actors in social transformation. By serving as a forum for “ordinary” workers, Processed World has reinforced the often suppressed truth that social knowledge and subversive wisdom flow from people's daily lives and not from an ideology or group of experts. By building a radical publication around art and humor, PW has reemphasized the importance of immediate enjoyment, both for surviving this insane world, and for reintroducing fun into radical attempts to change it.